Give the wanted shade to the basis. Draw a line from the mid of the eyebrow to the other one, passing through the core center. Draw a vertical line until the top of both the ears. Divide the back sector into three vertical sections. Start from the central section, raise horizontal locks at 90°. Cut at the length of about 2 cm. Make the same cut at the lateral sectors. 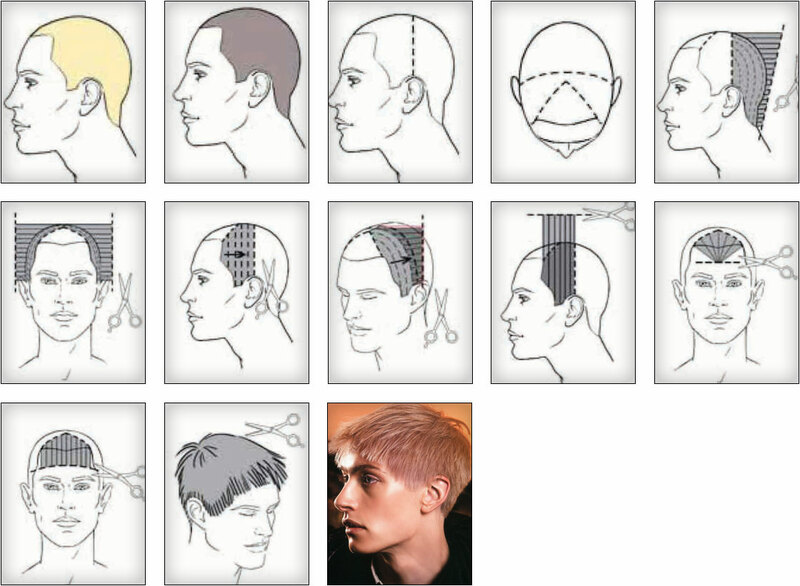 Raise locks at 90° at the sides of the head too. 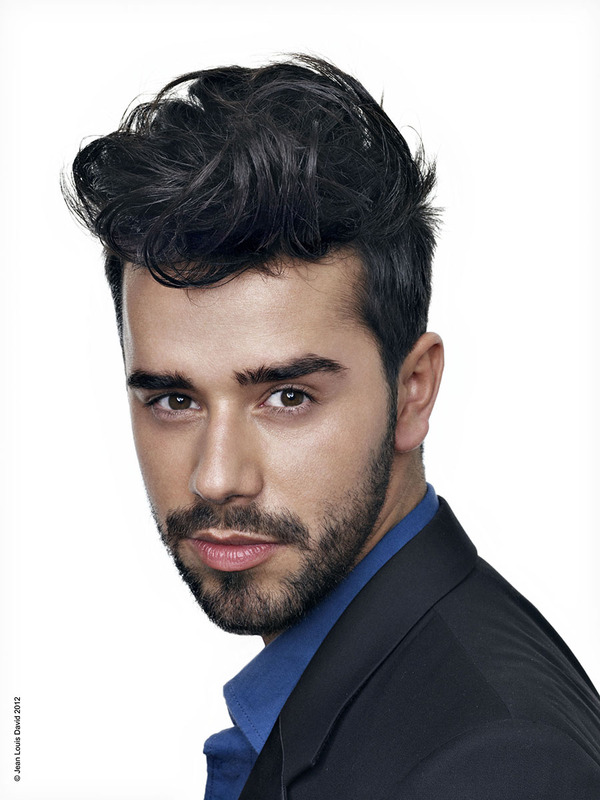 Realize a lock of disheveled hair by linking the front section to the back length, carrying back horizontal sections. 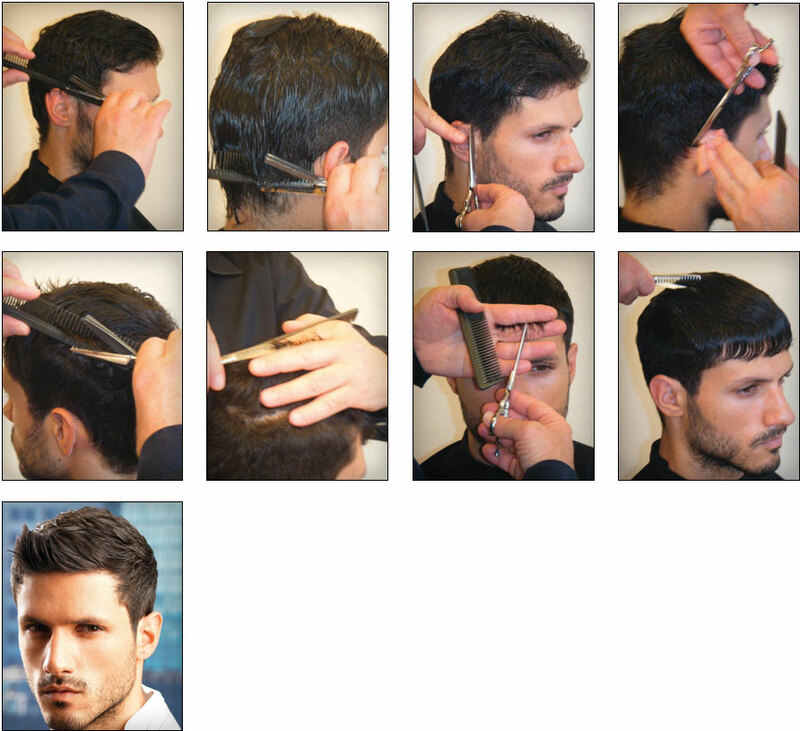 Cut with scissor-smooth blade-on comb technique, the right side zone and extend towards the intermediate linking zone. Cut the tapering zone to extend in the intermediate linking zone. Link the intermediate linking zone to the lateral sides. 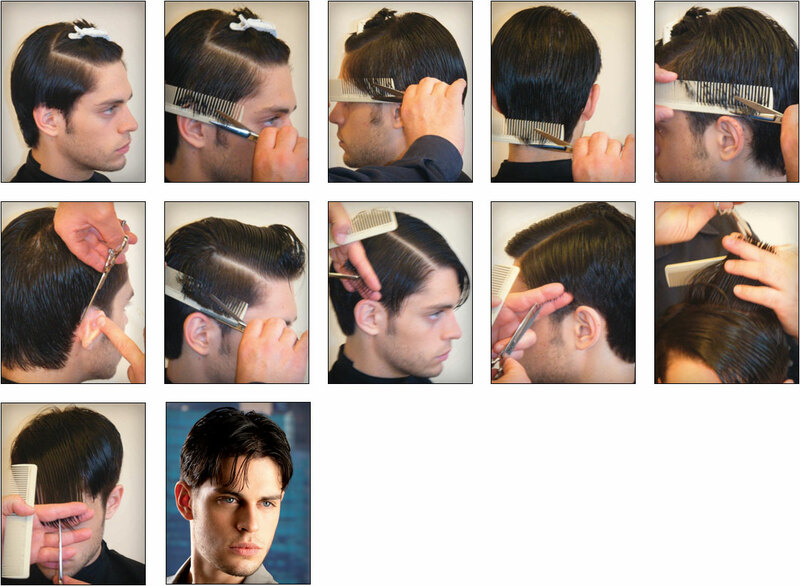 Light the lateral sides with scissor and blade alternated. Cut to extend the right side of the top referring to the cheekbone. Cut with the same technique the left side of the top referring to the eyebrow. Cut the top with the scissor blade technique, to extend towards the right side. Personalize the fringe with the same technique. Draw a line from ear to ear passing through the external centre. Limit a triangle on the front included between the eyebrows and the top. Cut the back section with a light diagonal from 0,5 to 7 cm. Pass to the intermediate section. Cut the side parts in square starting from the length of the back sector. Carry every lock to be cut upon the one already cut with a light carriage in order to get a longer length on the front side. Remove the point remained after the previous action, by scaling down in square at the length of 7 cm. Carry the front triangle ahead and cut in one solution at the length of 4 cm. 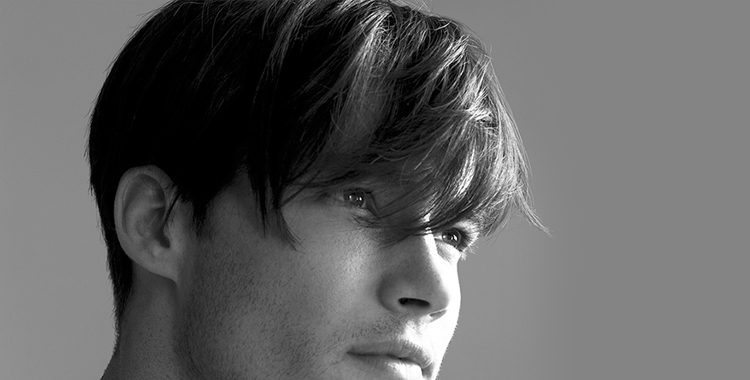 Finish the fringe in order to get a slightly concave effect. 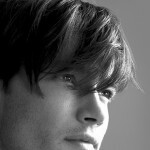 Light the whole volume with cogged scissor. Comb the hair in free fall. Cut with scissor blade technique alternated on comb, starting from the right side. Go on the circle leaving length in the intermediate linking zone. Define the perimeter starting from the whiskers. Unify with scissor alternated blade the intermediate linking zone leaving the point in the linking zone. Cut the top with scissor alternated to blade to extend in the front zone. Define the height of the fringe. Personalize the top with scissor/blade alternated. Beirut – Rawche – Carcas – Jurdi Building Groud Floor.